Okay, I’m taking over the blog today since the authors have been down for the last couple of weeks fighting with a nasty case of bronchitis/pneumonia. Mind you, they’ve also been trying to get the anthology finished and ready for release. We’re all hoping for it to go out before Halloween, but with all that’s been going on it might not be until early November. We’ll see how things work out. In the meantime, let’s talk about that anthology. Untold tales… not just about me but Lisa, Marisa, Otto and even some familiar faces from the first two books in the Para-Earth Series (“The Bridge” and “The Ship”) which we’re a part of. A few of you may be asking, why does the Para-Earth Series seem to have smaller series within it? It’s more a case of different sets of characters being focused on within the series. As you will see in the anthology, the authors are starting to mix us all together in anticipation of a much bigger cross-over that is currently in the works. Or rather towards the end of that upcoming novel (which admittedly has been in the works for several years) which the writers hope to have close to (if not actually finished) before the end of next year. Part of the problem with that book was the fact that me and my friends’ story got in the way and had to be put out first. Then, life got in the way which further complicated getting “The Door” heading in the right direction. But things are improving on that front and progress is being made as I type this entry. I will be making not one but two guest appearances in it as well as some ‘friends’ you’ll be meeting in “The Vampyre Blogs – One Day At a Time”. 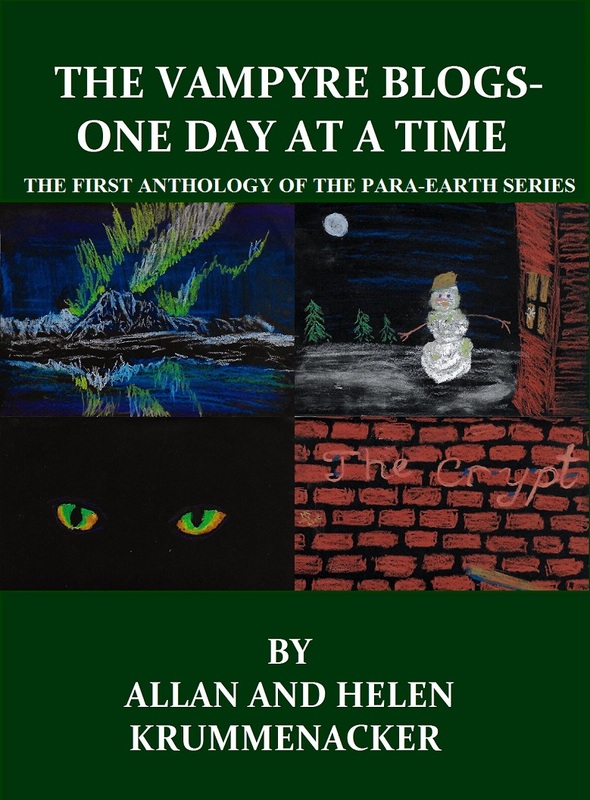 So you see, all these delays do serve a purpose as Allan and Helen continue to introduce you all to more Para-Earths and those who inhabit them. Some of those being we meet will be scary, some will be friendly, others well… you’ll have to wait and see. But rest assured, all of us will do our best to keep you glued to your seats while trying to get your hearts racing with each new installment.